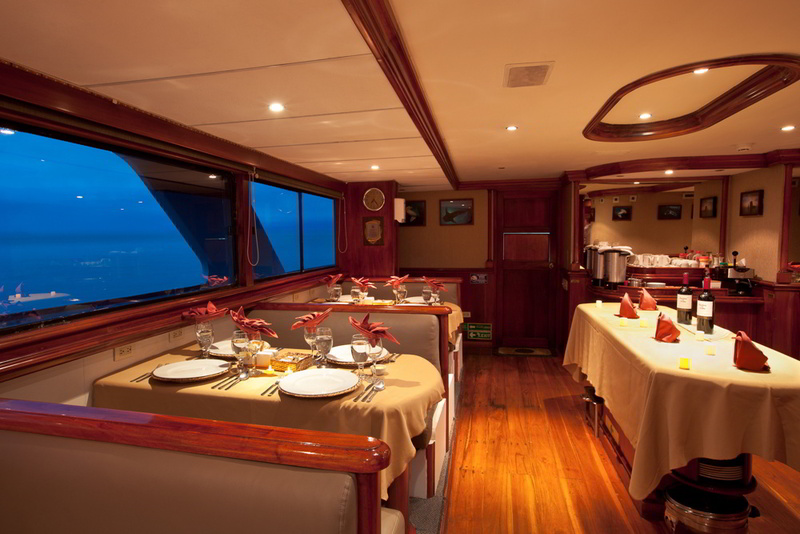 The luxury Galapagos Sky offers a state-of-the-art live-aboard diving experience in the Galapagos, known to offer some of the world’s best dive sites. The 7-night cruise offer the chance for extraordinary dive encounters on the Galapagos islands beneath the waves, as well as three land excursions to see iconic wildlife above water. The Galapagos Sky is the best diving cruise in the Galapagos. 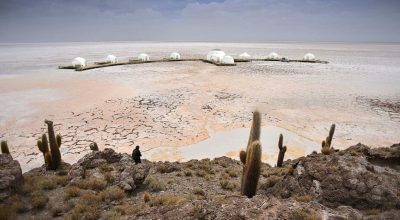 Hosting 16 guests in eight well-appointed en-suite cabins, all rooms offer twin beds or one king. Each cabin features a private en-suite shower with bathrobes, hair dryer and biodegradable toiletries. 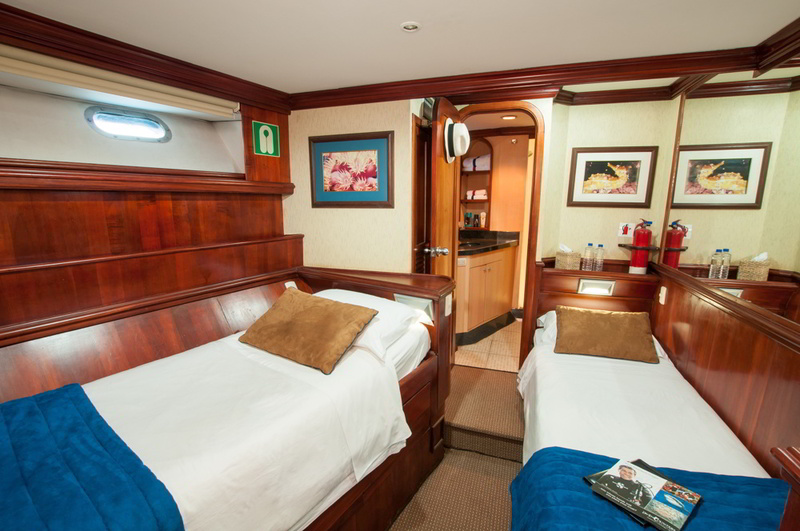 The vessel also features a comfortable lounge for relaxing in, dining space, sun deck with loungers and spacious dive deck for preparing all your diving equipment. 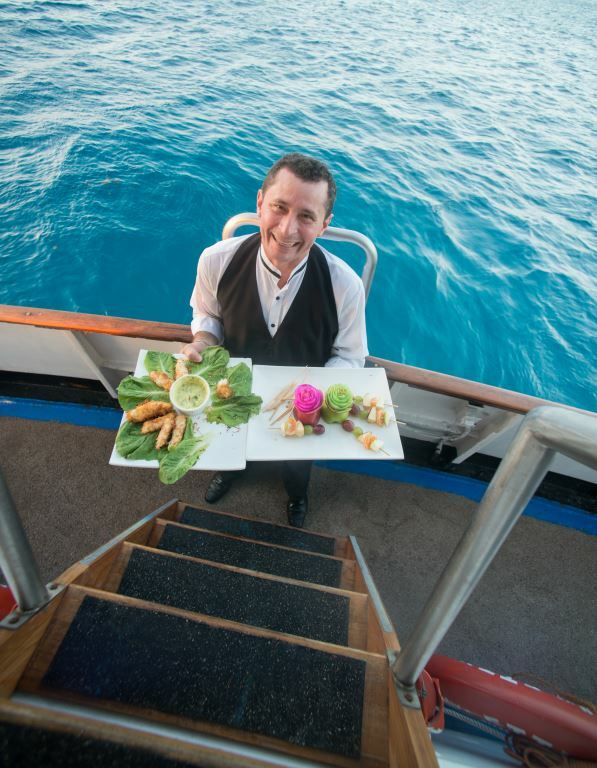 Dining on board includes drinks with dinner. Dive equipment and cameras are available to rent. The astounding marine diversity of the Galapagos makes it an incredible dive destination. Throughout the trip you’ll get up close to schooling hammerheads, rays, turtles, huge schools of fish, resident mantas, seasonal whale sharks and much more with approximately 17 to 19 dives throughout the cruise. There are three days of diving Wolf and Darwin islands on every cruise. Five and a half od the eight day cruise is spent diving. The dives are led by a naturalist dive instructor and dive master and after each dive you’ll be welcomed back on board with hot showers on the Dive Deck and fresh hot towels. 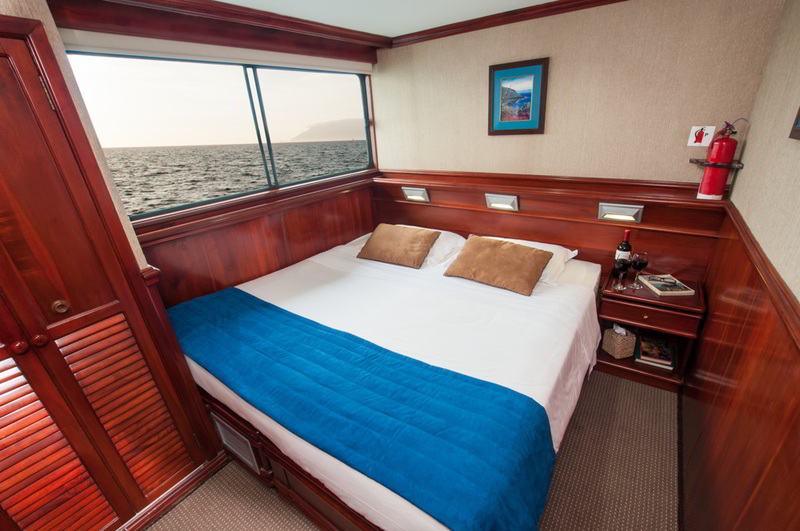 Each itinerary aboard the Galapagos Sky includes dives at the famous Wolf and Darwin Islands, considered to be home to some of the best diving in the world. These are some of the more remote islands in the Galapagos, therefore the Galapagos Sky itinerary has a couple of long overnight navigations to reach these diving spots. While diving is possible on the central islands, the more remote islands of Wolf and Darwin are known to be the best dive sites in the area, where you will enjoy four dives per day. 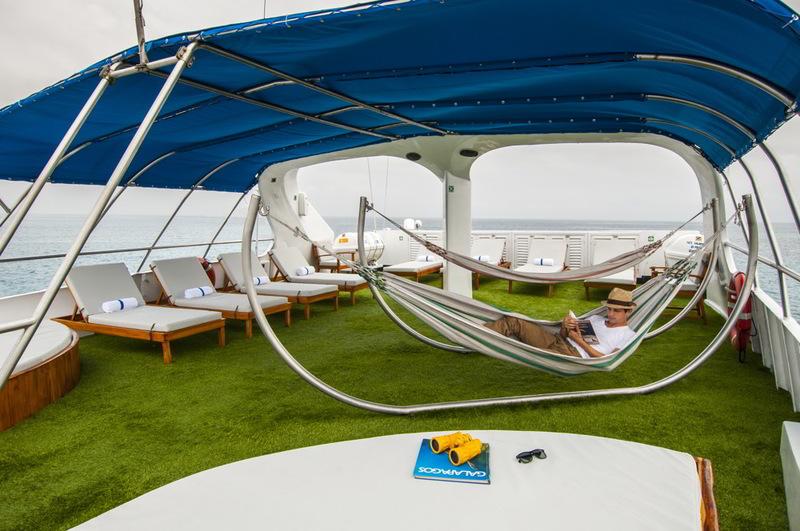 The Galapagos Sky is designed for experienced divers only. 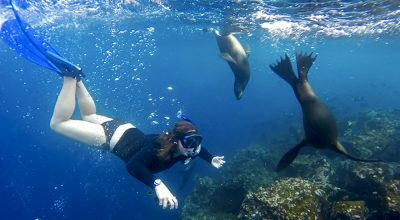 Diving in the Galapagos is considered advanced level, because of the presence of strong currents, cold water and at times limited visibility. Diving is always made from from tenders/pangas (small inflatable boats). To join the Galapagos Sky you must already have had experience diving. You need to be comfortable doing negative (sometimes rapid) back-roll entries/descents from small boats. 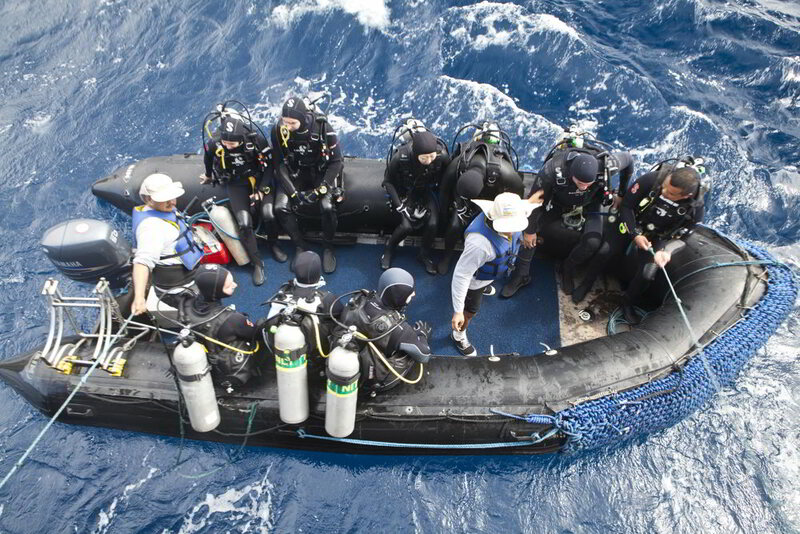 The recommended requirements to join this diving cruise are 50-100 open water dives, experience in currents, ability to remove gear in the water and ability to get into small boats in choppy seas. 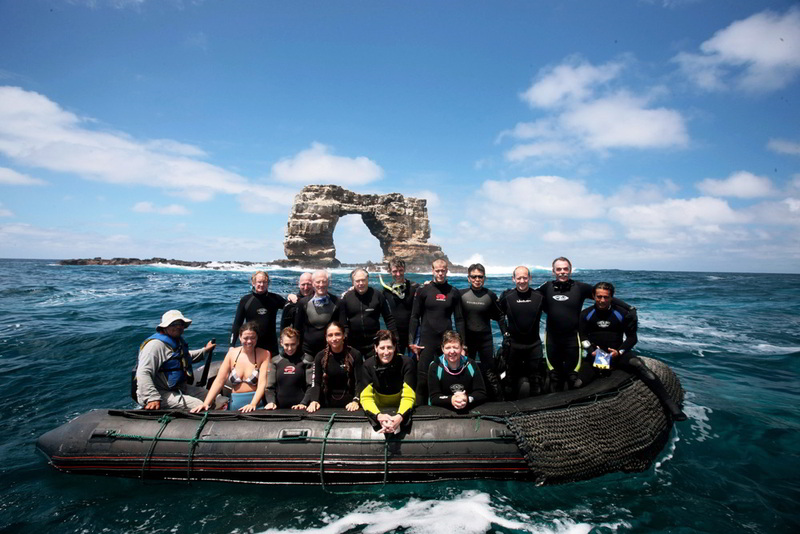 For mixed groups of divers and non divers looking to travel to the Galapagos together, or if you are a qualified diver but don’t want to dive every day, then you should take a land-based trip to the Galapagos. 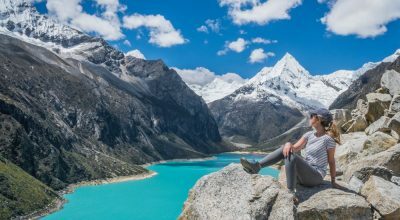 This means taying in a lodge or hotel and taking day trips to dive near Santa Cruz and Baltra – and allows time for non-divers to take non-diving excurions. 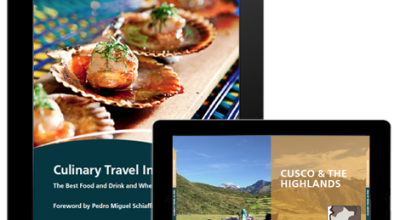 A land-based stay can be combined with a naturalist cruise.